Fascinating. My brother and I used to collect the bus tickets in Adelaide in the 60′s because there were aphorisms on the back. 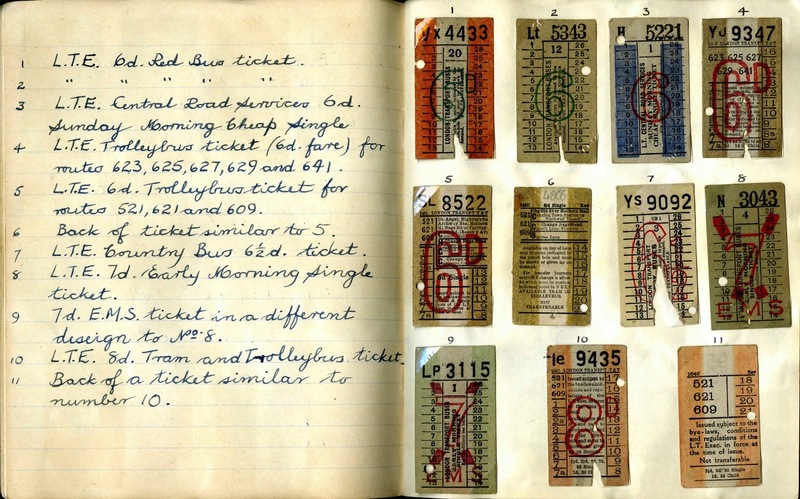 The man who had the contract to print the tickets, a Mr Leal, had collected the small sayings over many years and added them to the tickets. I wonder if any of the above tickets have something like that? I love this article the humble ticket elevated by being kept in such a cherished and articulated manner these pages are beautiful. Bring back colour and variety to our tickets of today how wonderful that could be ! 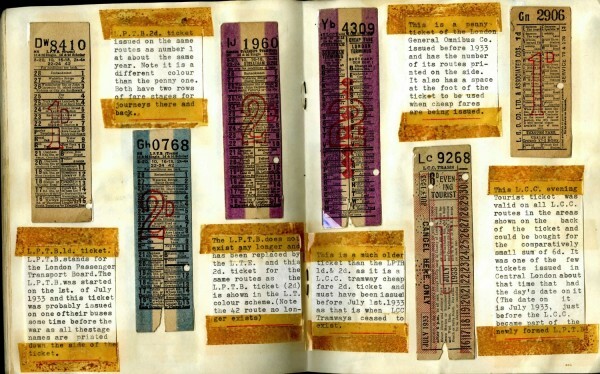 A handsome collection; and one VERY seriously in need of the attentions, I think, of a paper conservator if oxidation and associated damage — the tape stains! — are not to go too far; they have already advanced substantially. 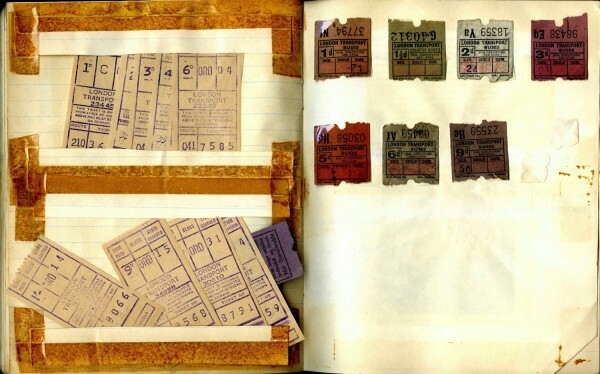 Very unlikely that any of the materials used, album or tickets themselves, were acid-free, and until that status at least is corrected corrosion from within will continue. I used to do those squiggles on my school books too. My son and his friends have a different buy equally distinctive set of doodle squiggles. I love this! 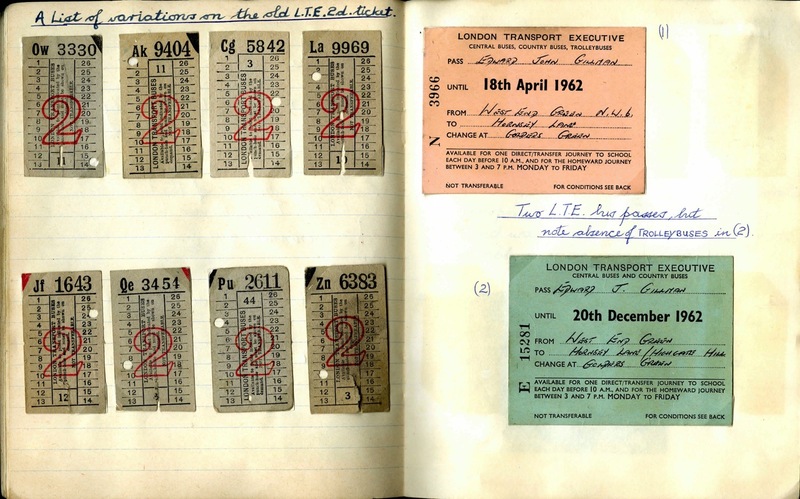 What career did such an astute young archivist eventually choose for himself in life? It is a fascinating collection. The lucky numbers adding to twenty one brought back memories for me. 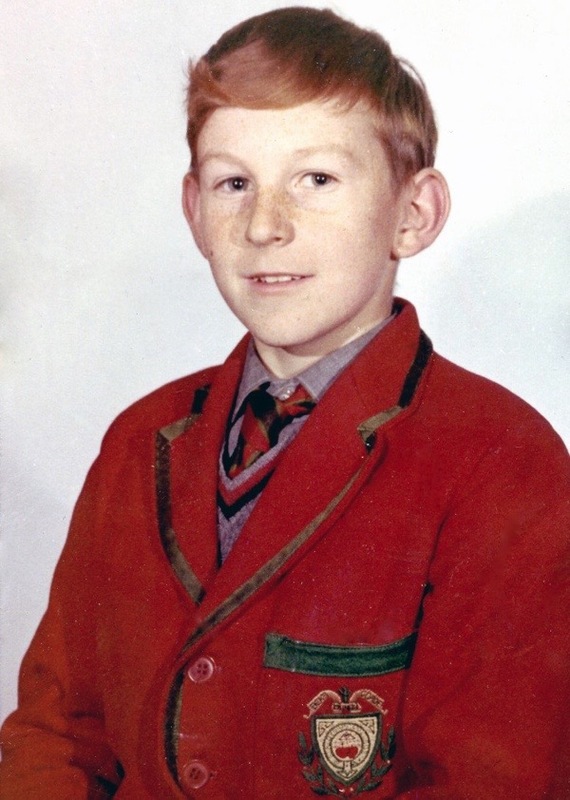 I grew up in Cardiff in the 1970s and for several years travelled to school by bus. You were the envy of your mates if the 5 ticket serial number “worked”. If your serial number was 73385 the mantra was “There was a woman of 73, she had 3 children, 8 died and 5 were left”. If worked, that WAS a good day. I to used to like the red rovers tickets. I would like to know if possible what John did or maybe still does for a living. Was it anything to do with transport?Anyway great story all the best John. Priceless, brilliant and utterly wonderful. 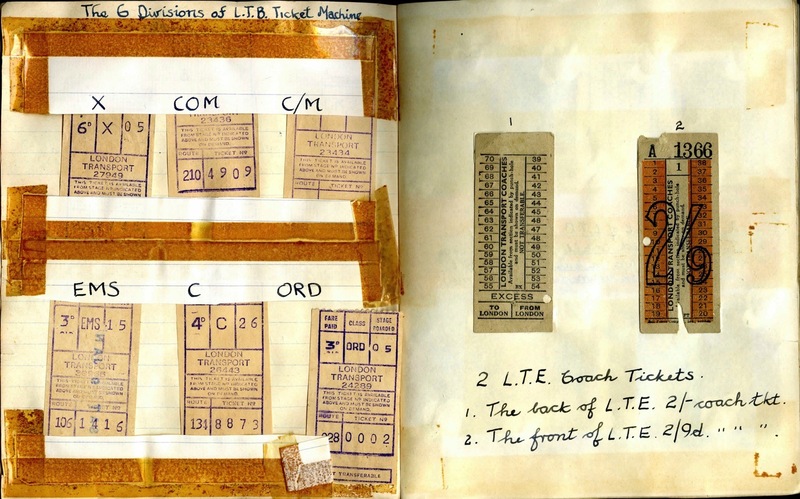 I think the yellowing sellotape even adds to it plus the exercise book with its artistic decoration too – what a treasure trove. I am intrigued as to what John went on to do I hazard a guess at a career in engineering perhaps or technical design? This has made my day . 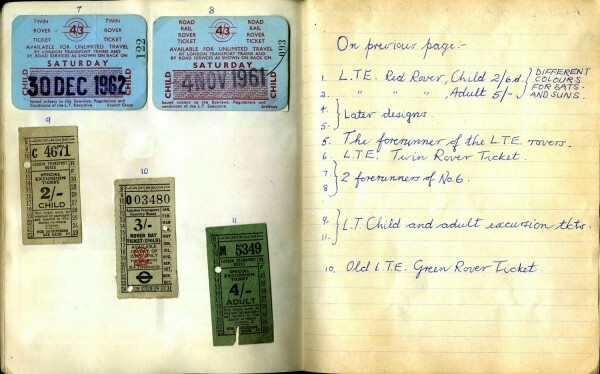 I too remember having a day out with a Red Rover ticket and getting the paper bus tickets as I travelled up and down the Kingsland Road on my way to school . 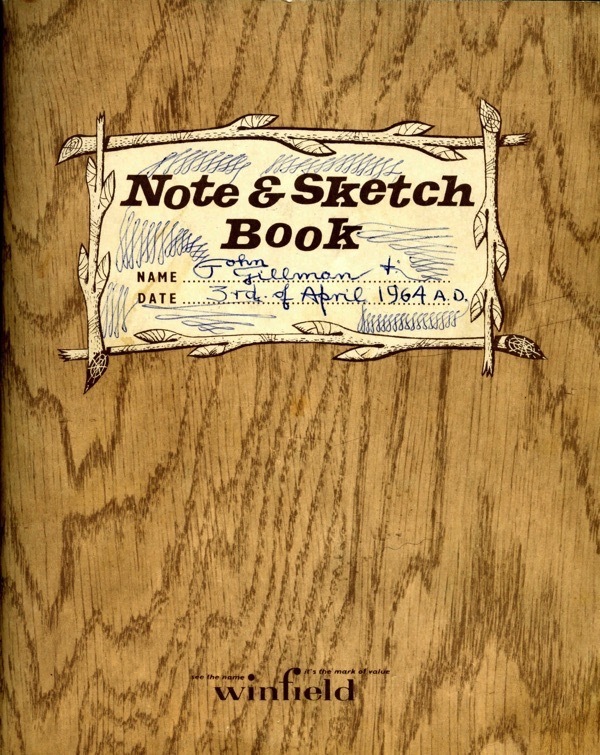 Best of all I like the humble notebook with the date , AD ! Also to see the name WINFIELD printed at the bottom of it which I think means it was from Woolworths ? Thank you , John for this beautiful collection . 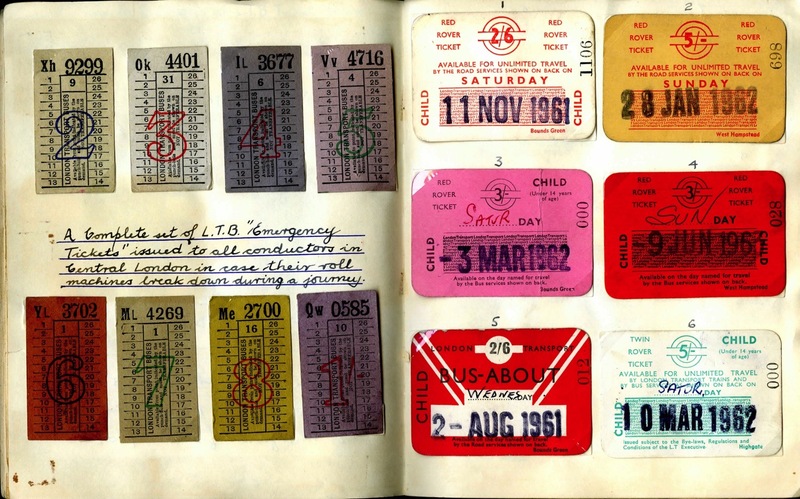 What a fascinating collection and well done GA for suggesting that it should be preserved safely, these things are so easily lost or thrown in a skip nowadays. 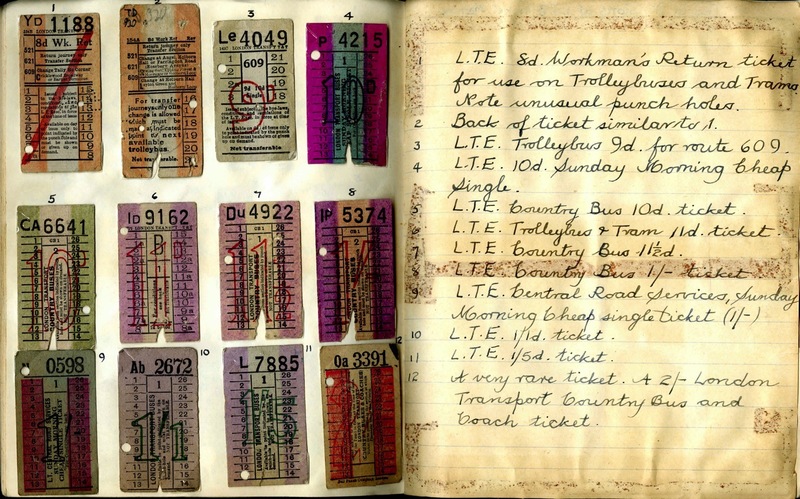 I have happy memories of the man who used to be our bus conductor in my schooldays and his collection of multi coloured tickets in the wooden holder, I loved them just because of the colours. The sound of him whistling through his teeth as he came to take your money and the ding ding of the holes being punched in the tickets, happy days. And my best friend went on to marry the conductor’s son but I don’t think that any tickets survived there, a pity!! A very fine story! And John Gillman did it well to collect these analog graphic icons. Who of the children today collect such a thing…? when I was young the boy next door did this too – more or less the same obsession. He grew up to work for London Transport. Oh my goodness -this takes me back. 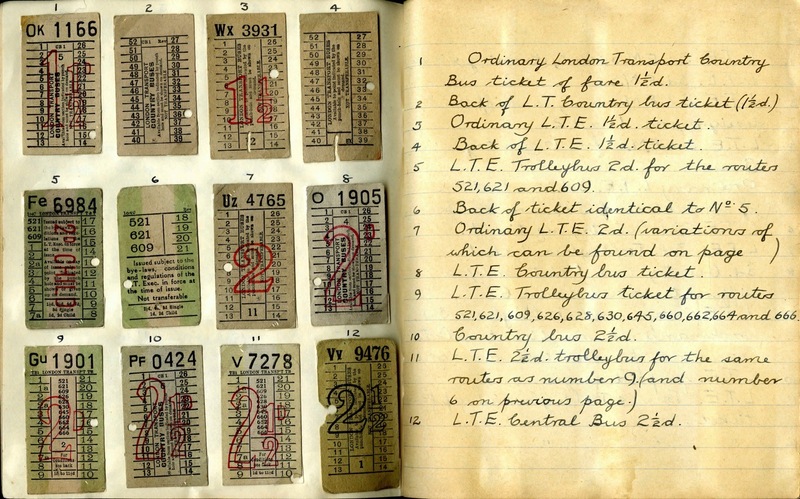 When I was at Junior School I had a bus ticket one day which had all noughts for its numbers! I was so proud of it and took it to school to ‘show and tell’. Alas, the wonderful ticket was STOLEN from the display table in the class-room. You can see it still rankles! This brings back many happy memories for me from my own childhood in the 70′s. My cousins and i would leave the leafy suburbs of Harrow and work our way into London via the no 18 along the Harrow Rd. We would go to Westminster and then usually wander the lanes on the south side of the river down to Tooley St for a glimpse at the London Dungeon, the street alone was enough to terrify me! With our packed lunches in a ‘good food costs less at Sainsburys’ carrier bag we would spend those Sunday hours walking literally miles around the capital to sights such as Big Ben and St Paul’s which were just breathtaking to a young kid like me. The day was long and our return journey home was tiring and ultimately ended with a fall-out between us all. Mind you, we always managed to end up doing it again whenever the time of year came calling for a young man to go a wandering. Happy days and an education in geography, history, social studies and a lot more. Many thanks, great post! mmmh! pie and mash and liquor! Beats all the curries, pizzas and kebabs! This brings back memories! 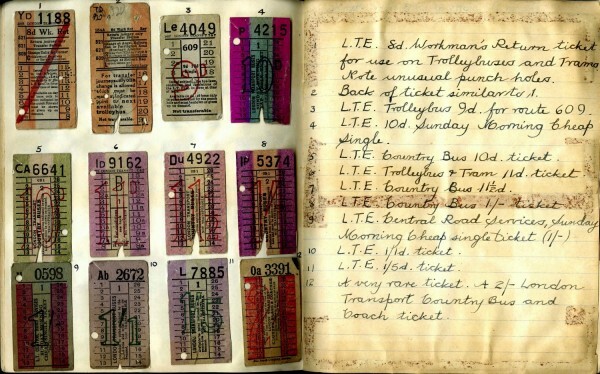 I remember being taken by my father on a tram during Last Tram Week and him making a great fuss of the tickets and telling me that I must on no account lose them. They’ve long since gone of course! I’ve lived in East Kent for decades now and I have a feeling that John’s projected journey to ‘Pratts Bottom ‘ may have actually been to a small village near Canterbury called ‘Pett Bottom’ – which is even more hilarious if you think about it…. Wonderful stuff. Incidentally it wasn’t just boys who would travel around London with red rovers. I used to do this with my female friends aged c.10 without any hysteria from parents, press etc . 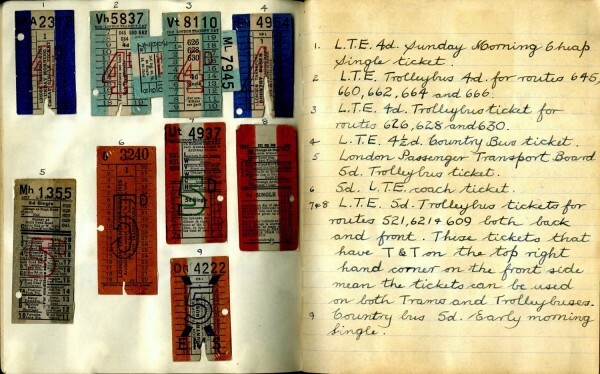 I look forward to looking at the collection at the Bishopsgate Institute. What a wonderful collection. About that time I and my brothers were assiduously ticking off Routemaster bus numbers outside West Ham bus garage. 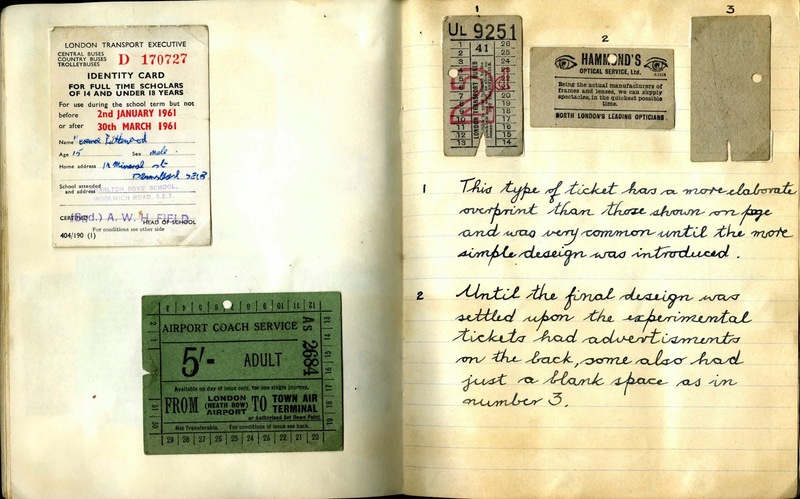 As an inveterate collector of many weird and wonderful things, who luckily made a career out it as a museum curator, I was very impressed with John’s documentation of his collection – just what an archivist likes to see when offered such a collection! Thank you for displaying this great collection. I heard John’s interview with Robert Elms on Radio London and really enjoyed listening to the background to this fascinating exhibit. “Evocative” is definitely the word that comes to mind as I see these cherished old friends. In the 1960s I used to sit on a wall by the bus stops on Brixton Road and write down the car number plates. Pleasures were simple then! One observation if I may regarding different coloured tickets via a Gibson machine. 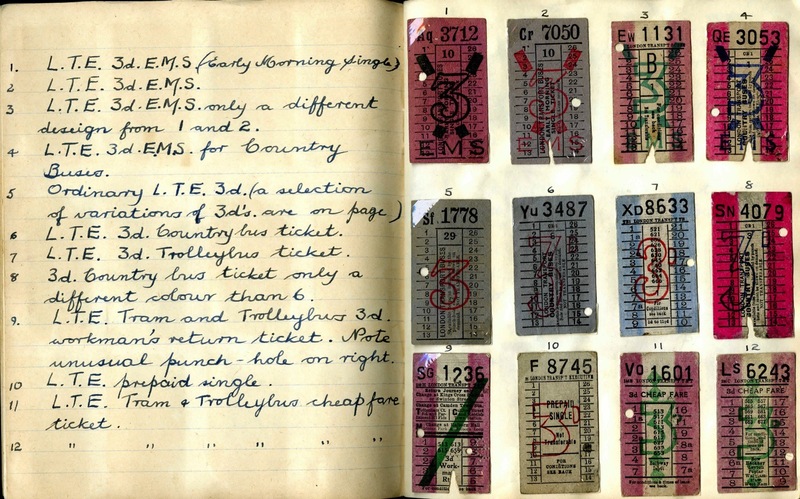 I was a conductor on the No 14 route, Putney (Oxford Rd.) – Hornsey Rise (Favourite) in the 1970´s and 80´s. 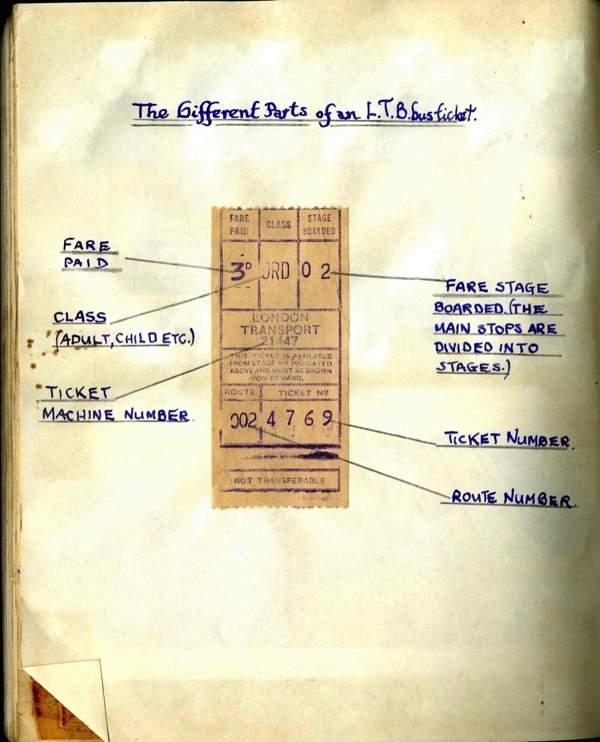 Before every journey you were required to check your ticket machine against a way bill to make sure the tickets sold matched the machine, this was mainly for the benefit of any Revenue Inspector that may board your bus so that he could verify that a passenger had a valid ticket. Anyway, before your shift started you’d refill your machine with a new ticket roll and stock up with a few extras. 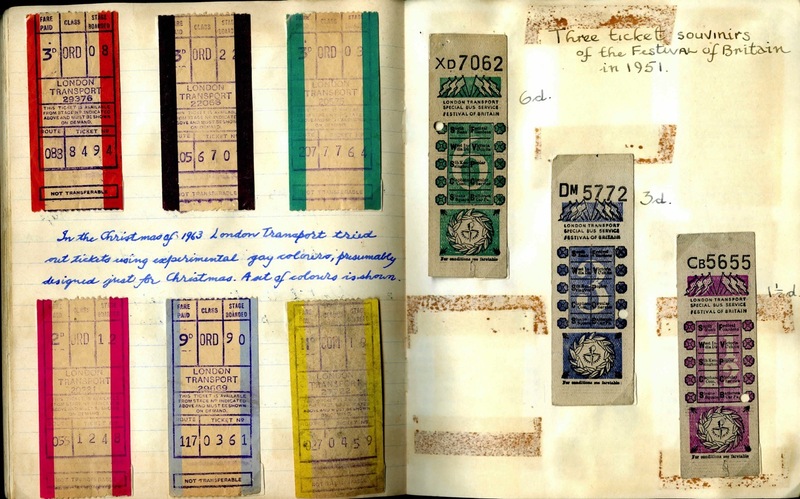 As my route passed by Harrods it was common to have coloured rolls, usually yellow, orange or pink but on the reverse an advertisement was also printed, this was done by the actual machine itself as the rolls were blank. 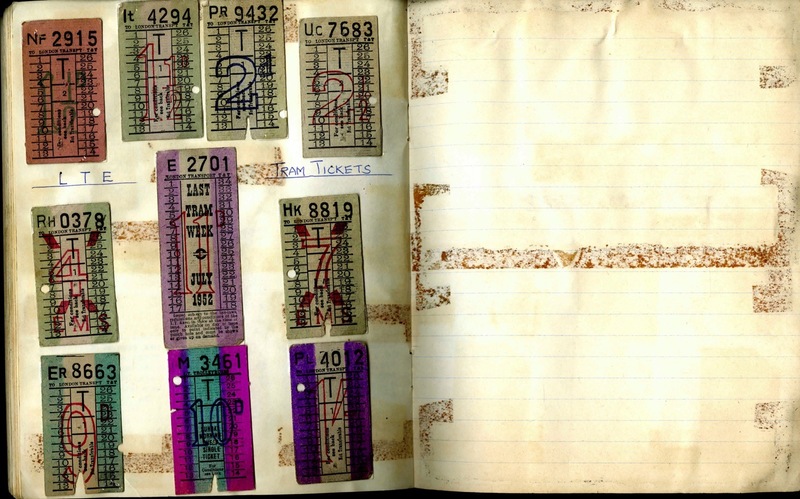 Strange thinking back now I never asked how it was done and who paid for the special mechanism that had to be installed to print these unique tickets. I say unique as I never saw any other route tickets with the same design.